Nearly 22,000 physicians across 25 specialty areas participated in Medscape’s third physician compensation report just released. Overall, it appears that physicians’ income is on the rise. On the opposite end of the scale, pediatrics was replaced as the lowest paid specialty by HIV/ID. Mean compensation for about one-third (8) of the specialties surveyed topped $300,000 annually. Orthopedic surgeons showed the highest increase. 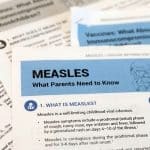 Endocrinologists and oncologists noted a slight decline. Overall, male physicians earn 30% more than women (17% more in primary care). Those with board certification earned significantly more than those without it ($150,000 vs $251,000). The percentage of physicians involved in Accountable Care Organizations increased significantly from 2012, from 8% to 24%. Physicians in the North Central region of the country earn the most ($259,000), while those in the Northeast Region earn the least ($228,000). Compared with 2012, compensation for physicians in solo practice declined ($216,000 vs $220,000), while that of physician employees increased ($220,000 vs $194,000). 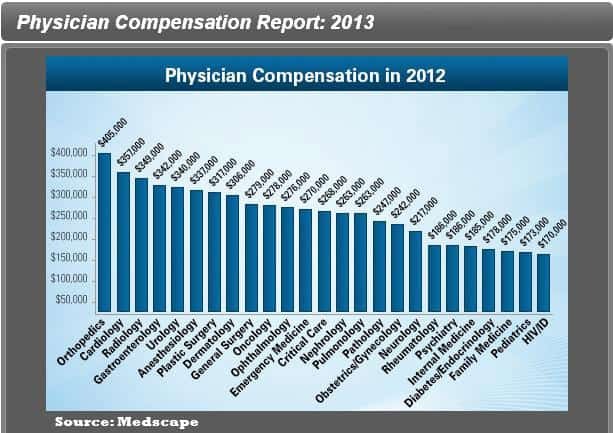 Click here to view the full Physician Compensation 2013 report by Medscape.